Unlike Marillion, Pendragon have had to slog it out arduously throughout their career in order to achieve their level of success. The latest offering is an ambitious project to say the least. And if you miss the everything-and-the-kitchen-sink style of cover art that once graced Marillion albums, that's here too! A double-CD package, this release consists of the album proper on disc one, plus an extra disc of new material, limited to the first pressing. As goes this pressing , so goes the bonus disc. Arrangement-wise Pendragon puts more of their emphasis on the lyrics and vocal delivery than on instrumental flights of fancy. The songs are structured rather basically nowadays, but their playing is a lot stronger, and does allow for some short solo sections where Clive Nolan gets to show his synth work. But he tends to stick to the same few patterns. This band captures quite deftly the late 70s sound of Genesis (circa And Then There Were Three) and some of Pink Floyd's sound on The Wall. Nick Barrett certainly contributes to this with his very fine Gilmour-esque guitar playing; I wish they'd give him more room to stretch out. What really separates Pendragon from others of their ilk though, is Nick's voice, and his penchant for constructing those kinds of memorable, reach-for-the-stars melodies, and robust arrangements. Fans will be happy to know that they have made little concession to commerciality here, though "As Good as Gold" is as accessible as one can get and still avert the inevitable tomatoes labeled 'commercial' being hurled at you. The bonus disc gives you some single remixes, plus three more tracks including the twelve-minute "Master of Illusion." This material doesn't pack much in the way of surprises. Rather it is largely more of the same as was presented on disc one. Pendragon's new release, The Masquerade Overture, further proves that this band is one of the better proponents of neo-progressive rock. Not because of any great originality, but because of their sincerity and trueness to timeless styles. 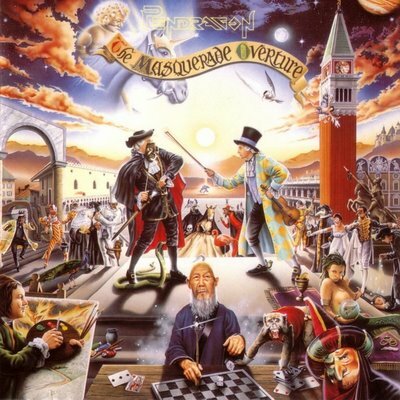 Masquerade Overture is full of references to Duke-era Genesis, Marillion, and even ELP. I have heard a few Pendragon songs in the past, and was impressed by the way they took chances with tricky arrangements. This new album has all that and more, with a couple of catchy potential singles to frame the album. "As Good as Gold" is a memorable song that is deceptively simple, but quite impressive musically. It's at least as good as anything Marillion has done in the last six years. That says a lot. While the sound is primarily keyboard-based, Pendragon also possesses a fine guitarist in the Steve Rothery style, and an excellent vocalist. Just witness the drama of "Guardian of My Soul" for proof of this. Unlike many neo-prog bands I have heard, this band effectively evokes the theatrical intensity of Genesis and Marillion, while steering clear of direct copying of their styles. Limited editions of the CD were released with a bonus disc, featuring edited versions of "As Good as Gold" and "Masters of Illusion," two potential singles. However, the bonus disc also includes the moody "Schizo," which is in a quite different style from the album, and is actually one of my favorites. Recommended highly. Try to get the bonus disc if you can. For 15 years Pendragon has been a fixture on the English progressive scene. They've got solid support from a devoted European fan base, consistent albums, and a refined sound. They've got power chords and major key signatures in 4/4 time. All this sound familiar? Nick Barrett is the key songwriter who demonstrates a keen ability to create a formulaic style based on one of the "standard" progressive rock formats — typical vocal lines, piercing lead guitars, dramatic keyboards, and thunderous drums. Ho hum. Sounds like almost every prog hook, theme and coda have been incorporated into Nick's songs. It's no big challenge to figure out which classic prog track has been nicked, diffused and incorporated into an all-too-familiar "new" piece of music. This may be okay — I'm still undecided at this point. Their new effort has managed to garner the same kind of support in the U.S. as some of their contemporaries (e.g. IQ or Jadis). It may also be less cliché than their last few releases, but there are no new tracks of the caliber of "Alaska" and "The Black Knight" from The Jewel. Are there any new surprises for fans? Not per se. More of the same unadventurous approach, which could be considered good since they do have their own style down pat. Do I dare call them the Journey of prog rock? The lead-off track "As Good as Gold," with its cliché rock lyrics, could have been big 20 years ago. And its intro choir: yikes! Am I at a high mass or what? That part could scare people into lunging for the fast-forward button. In my opinion the most memorable things are the album artwork and impressive packaging. Early releases of the album come with an additional bonus disc that contains four tracks.